Our trail-riding customers love Tucker saddles. They're top-of-the line in quality and comfort. We're excited that Tucker has created two new models specifically for gaited horses. 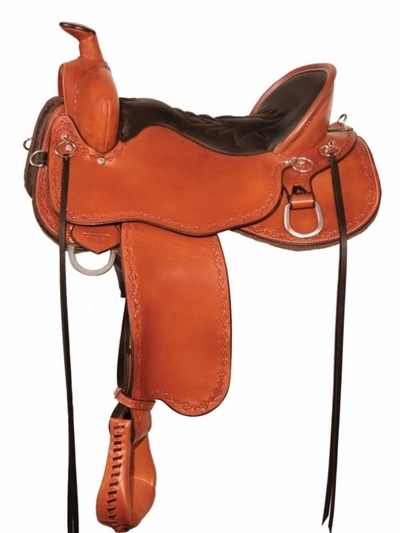 This beautiful trail saddle is built on a gaited fit tree and features a close contact skirt shape for precise cueing. The adjustable position close contact rigging is the best position for your horse and eliminates bulk under the leg for close contact. The best part of Tucker saddles is always the seat; the gel-cush provides ultimate comfort. The saddle also includes preset fenders for reduced break-in time as well as ErgoBalance stirrups for decreased knee and ankle fatigue while promoting balanced riding. The Supple Ride leather option features seat jockeys and fenders made of top grain leather, laminated and stitched to provide a soft, broke-in feel right out of the box. Seat Sizes: 14.5" 15.5" 16.5" 17.5" 18.5"